The retirement of the 89-year-old, the longest-serving reporter in the White House press corps, was announced by Hearst Corp, where she worked as a newspaper columnist. 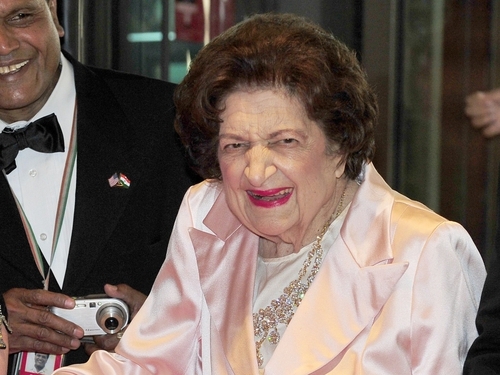 ‘Helen Thomas announced Monday that she is retiring, effective immediately,’ Hearst News Service said. Ms Thomas, who served for decades as the White House correspondent for United Press International (UPI), apologised last week for the remarks she made about Israel during a 27 May 'Jewish Heritage Celebration' at the White House. Asked at the event by the website RabbiLive.com whether she had any comments on Israel, Ms Thomas replied: 'Tell them to get the hell out of Palestine. White House spokesman Robert Gibbs has described the remarks as 'offensive and reprehensible' and Ms Thomas issued an apology on her website, HelenThomas.org. 'I deeply regret my comments I made last week regarding the Israelis and the Palestinians,' she said. 'They do not reflect my heart-felt belief that peace will come to the Middle East only when all parties recognise the need for mutual respect and tolerance. May that day come soon,' she said. Ms Thomas has covered every US president since John F Kennedy and is a former president of the White House Correspondents Association. The association board that Ms Thomas's comments were 'indefensible'. 'Many in our profession who have known Helen for years were saddened by the comments, which were especially unfortunate in light of her role as a trailblazer on the White House beat,' the board said. Ms Thomas had been scheduled to deliver a 14 June commencement address at Walt Whitman High School in Bethesda, Maryland, outside Washington, but the school said Sunday it had cancelled her appearance. 'Graduation celebrations are not the venue for divisiveness,' Whitman principal Alan Goodwin said in an email to parents at the school. 'Graduation is the time for a cohesive and joyous celebration of our students' achievements; other forums exist for discussions of political issues,' Goodwin said.